This year, the Costume Institute has created a jewel box for colorful gems of silk and tulle designed by Charles James, the master manipulator of seams and an expert of controlled volume. The imaginative gowns, with names like “Cloverleaf” and “Umbrella,” share space with wool coats and suits of equally complex designs. From daywear to eveningwear, James used creative construction techniques to highlight and transform the woman framed within the yards of fabric. Image by Ruth Fremson of The New York Times. The exhibition is in two galleries, the new Anna Wintour Costume Center and the special exhibition space on the first floor. The entrance to either space requires a walk past ancient sculpture, and the comparison between the carved stone and the gowns is inevitable. 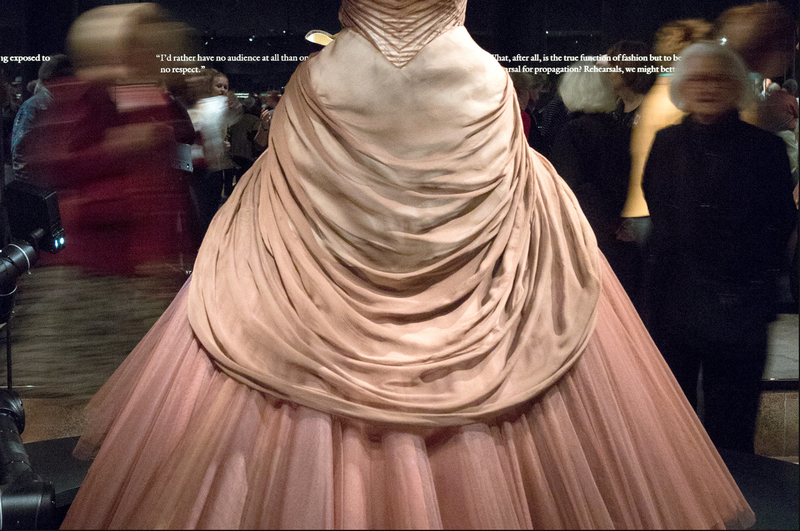 While both include draping, it is apparent that both the surfaces of the ancient sculptures and the surfaces of the sculpted gowns are merely decorative – as a solid core of stone supports the chiseled draping, weighty material supports James’ sculpted gowns. 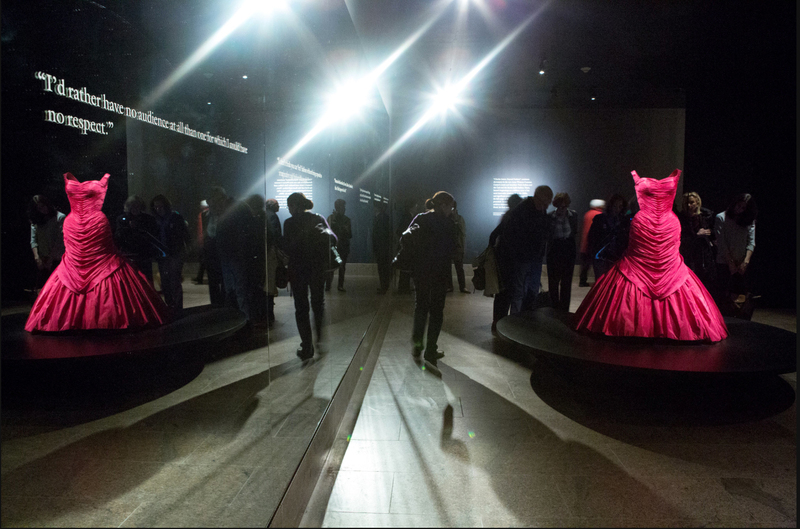 The dramatic evening gowns do not require a model, and for James, it appears that the body inside was merely an afterthought – a mechanism used to transport each of his sculptures through space and time into the view of the next admirer. At the entrance to the first-floor gallery, Millicent Rogers observes each visitor with a haughty disinterest. There is an affected confidence in her posture and in her stare as she models one of Charles James’ gowns, for she is wearing fashion’s impenetrable armor – haute couture. Though her portrait begins the exhibition, her presence is soon superseded by the words of the designer placed on glass and mirrors in both galleries. The gowns are reflected in these mirrors and framed by quotes of James describing his design philosophy and process. The show is not all seams and mirrors. Visitors with an understanding of clothing construction will appreciate the clever digital displays included in the show. 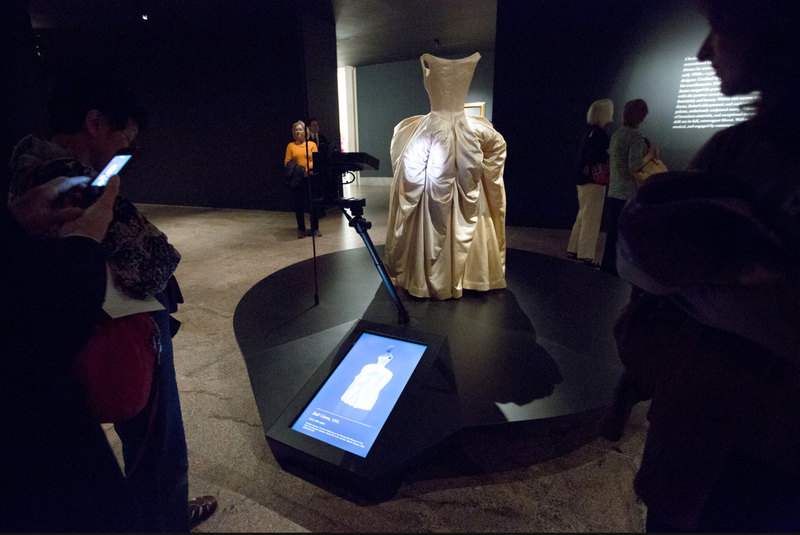 On the first floor, robotic arms scan the gowns as digital screens display pattern pieces in a methodical format, sometimes revealing the construction process of a dress, and other times dissecting a complex pattern. In this intense gallery, the screens provide a much-needed break from the dimly lit gowns. It is almost possible, without observing the screens, to misjudge the color of some of the gowns or to miss some of the fine details. Visitors may also notice some of the challenges faced in the conservation of these gowns. James frequently used heavy fabrics to help provide structure and volume; the weight of these fabrics has taken a toll on some of the gowns, as the thread tries valiantly to hold yards of fabric to upper seams of the dresses. One can only imagine the storage concerns related to gowns with so much material and volume. In the Anna Wintour Costume Center, visitors have an opportunity to explore the designer’s range by studying selected pieces from his archive and some of his more demure designs for suits and coats. These highly impressive, more casual designs are charming, though their visual simplicity belies James’ deceptively complex construction techniques. It is these designs that are most successful, for they lack the excessively contrived curves featured in the gowns of opulent silk satin. Many of James’ more casual designs could easily share space with some of the styles in recent runway shows. The “Great” coat, created by James in the early 1960s, would be a perfect addition to any wardrobe this coming autumn, while some of his other garments embody a tailored fullness that belongs to the past yet reminds us of emerging trends. This show is a timely one, for it seems that the “New Look” is about to become new once again. Charles James. 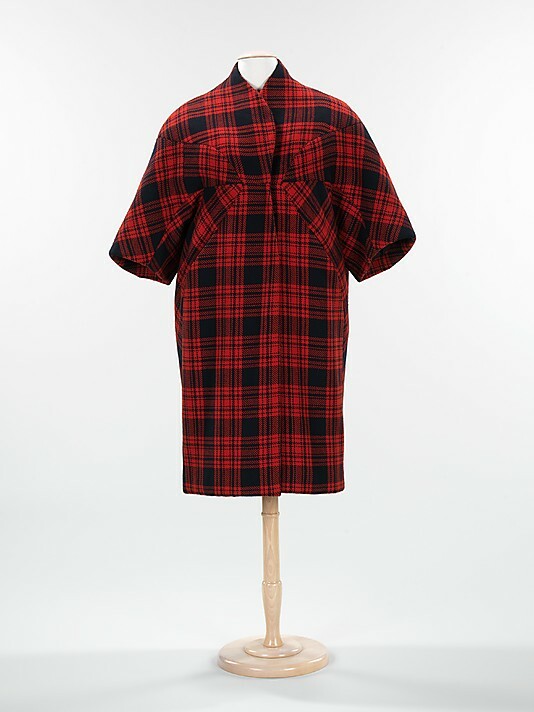 “Great” wool coat, c. 1961. Accession number 2009.300.451 at the Metropolitan Museum of Art. Author’s note: This review represents my opinion. While I recently accepted a job at The Metropolitan Museum of Art, I did not have the pleasure of contributing to this exhibition and its great success. As an employee, I have had the treat of visiting the galleries before and during museum hours, and I urge you: don’t miss the items selected from the archive. They are fascinating!